The spending of stimulus funds should come under intense scrutiny. There’s going to be some misspending of stimulus funds, but that doesn’t mean we shouldn’t try to keep waste and misguided priorities to a minimum. WASHINGTON – Facing criticism for her handling of federal stimulus money, Homeland Security Secretary Janet Napolitano said Wednesday that she would not start any new border construction projects and would review how her department selected projects that would get money. 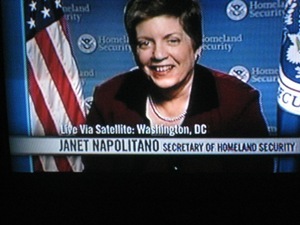 Napolitano has faced questions since The Associated Press reported last month that Homeland Security officials did not follow their internal priority lists when choosing which border checkpoints would be financed for renovations. Under a process that is secretive and susceptible to political influence, officials planned to spend millions at tiny checkpoints, passing over busier, higher-priority projects. Posted: 9/17/09 at 12:50 AM under News Story.